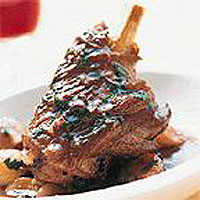 Lamb shanks need very little preparation, but should always be cooked quite slowly, to make them as tender as possible. Toss the lamb shanks in the seasoned flour and shake off the excess. Heat the oil in a flameproof casserole and cook the onions for 4-5 minutes, until they start to colour. Add the garlic and mushrooms and fry for a further 3-4 minutes, until golden. Remove from the pan and set aside. Add the lamb shanks to the pan and cook for 6-7 minutes, turning occasionally until browned all over. Return the mushrooms and onions to the pan and pour in wine and stock. Stir well and bring to a simmer. Cover and cook on a low heat for 1 hour until the sauce has thickened and the lamb is cooked through. Season to taste and stir in the parsley. Serve with creamy mashed potatoes. As an alternative to mashed potatoes, serve the lamb with couscous or rice.